Computer and video games have been inspiring art for years now, but the group Skrekkogle has drawn from classic inspiration for their newest piece Solitaire Win. Solitaire Win is a 5 foot wide, 2.3 feet deep, 1.3 foot high sculpture made of black foam, paper and tape. It immortalizes everyone's favorite end-game sequence, finally in 3D. The sculpture is not on display, as far as I can tell. It's one of a kind and not for sale, though there are numerous photos of it on Skrekkogle's website. The sculpture was built purely for fun, "Because we love beating the game, watching all the cards hop around. Hop hop hop." It took over a thousand cards, some of which had to be cut down and customized to create the hopping effect, to create the final sculpture. Skrekkogle is not an art collective. 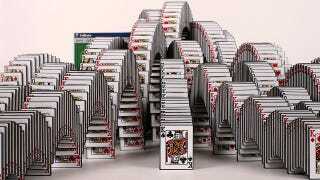 In fact, the people who worked on Solitaire Win don't even consider themselves artists. "We don't think of ourselves as artists, as we come from a product/interaction design background. What we see ourselves as is a studio that does what it very well pleases, experimenting with products and electronics and the like, not necessarily being tied to a client. " Click through for more images of this project from Skrekkogle's website.